Have you heard about this kinda MiNi version before? Of course not. Even, WhatsApp B58 MiNi has less size than the official WA for Android devices. This would the best solution for low-end devices which are suffering to handle the messenger in many cases. Even though it is coming with the less size, still it has basic privacy features which are currently used by many WAMOD enthusiasts. In that case, WhatsApp B58 MiNi APK is way better than any authoritative applications. I hope you would love this application since you downloaded. 1 What is WhatsApp B58 MiNi APK? 3 How to Install WhatsApp B58 MiNi APK? What is WhatsApp B58 MiNi APK? SAM also known as Naeem Ahmed founder of WhatsAppMods.Net continuing this application for his Website visitors since it lost official support from the TeamB58. I appreciate SAM work because he brings the MiNi version that every less than 1GB Phones user wants. 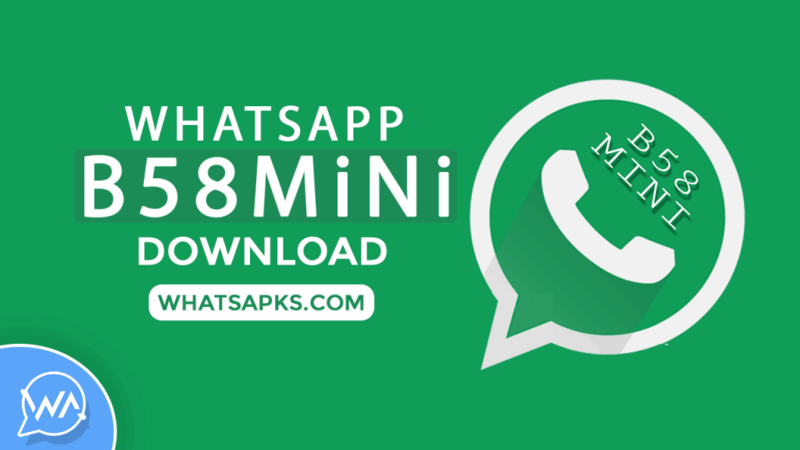 A Smoother and faster experience you will get when you start using this WhatsApp B58 MiNi APK. But, you don’t get any advanced features that are presently available in GBWhatsApp APK or FMWhatsApp for Android. Reset option let you back with all default settings. Update Button to know the latest version. Already you know that this is currently supporting by the developer SAM and he has many other mod to develop. So, it may take time to be updated to the latest version. Download WhatsApp B58 MiNi from below. It comes with the same package name of official one. So, you should replace with it. How to Install WhatsApp B58 MiNi APK? Are you using Official WA? If yes, then you have to take a backup by following our procedure. So, you can able to read your chat history or old messages later. Once you are done with the backup procedure. Now, dive into the installation. Uninstall the Official WA from your device. Install the WhatsApp B58 MiNi APK on your Android device. Allow unknown source if your device asks you while installing. Log in with your Phone Number and verify it. Tap on Green Restore Button. For those who think that just privacy mods are enough for their daily life, this is the best solution. I hope you would love this article. If you do, then share with your friends.